The primary focus is on the intent of special education law/rules/procedures as they relate to foundational concepts. These foundational concepts include FAPE, LRE, and Procedural Due Process with an emphasis on meaningful parental involvement, and outcomes/benefit. Emphasis will be on the administrator’s role in understanding and overseeing these concepts. There will be PowerPoint materials available. However, the majority of the time will be spent in discussion and dialogue about how these big ideas play out in day-to-day processes. DES MOINES, IA – The Iowa Department of Education will give Iowans a chance to weigh in on a plan to request a waiver from requirements of the No Child Left Behind Act during a statewide series of public meetings from Jan. 31 to Feb. 9. The Department will present details about Iowa’s waiver request and plans to develop a new accountability system that puts student achievement first but also focuses on student growth and assessments that align with the Iowa Core standards. In September, the U.S. Department of Education invited states to apply for flexibility from specific requirements of the No Child Left Behind Act in exchange for rigorous and comprehensive state-developed plans. Iowa’s application will be submitted by Feb. 21. States must address the following principles in their waiver applications: College and career-ready expectations for all students; state-developed systems for differentiated recognition, accountability and support; and support for effective instruction and leadership, including new guidelines for local teacher and principal evaluation and support systems. In a new video, Iowa Department of Education Director Jason Glass addresses the purpose of Iowa’s waiver request. Iowans who are unable to attend the public meetings can submit comments in writing to wilma.gajdel@iowa.gov until 4 p.m. on Feb. 1. For more information, go to www.educateiowa.gov. The January 2012 issue of The Cornerstone is now available! Scroll down to read articles or click on titles below. You can also download a PDF copy. Enjoy! In recent years, the federal Office of Special Education Programs in Washington D.C, known simply as OSEP to most of us, has downgraded special education practices and performance in Iowa’s public schools. In an effort to improve its grade for special education programs, the state department of education has taken strides to not only reduce the percentage of entitled individuals in the state, but to also improve the academic achievement of students identified in the current system. Iowa has one of the highest percentages of special education students in the nation and, at the same time, has achievement levels for special education students far below the national average. The achievement gap between students identified for special education and those not identified is one of the largest in the nation. We are being taken to task for both over-identification and low academic performance. The result of all this is a new system of child identification embedded in the RTI model. I see frustration at times in both AEA and LEA staff when it comes to how students are being identified for special education. Part of what causes some of this frustration is the persistent belief held by some that intelligence is largely innate and fixed. We now know from twin research and advanced MRI technology that as much as 75% of an adolescent’s intelligence is the result of environmental factors and that IQ scores can be raised as a result of sufficient high quality instruction. That’s a frightening paradigm shift for educators. It’s certainly a call for universal preschool and extended school programs for at-risk students, but it’s an equally powerful plea for quality core instruction. We have always believed we could help kids achieve at higher levels, but the belief that we can actually make them smarter is a newer notion and, while a bit frightening, it’s an exciting one! To register for any class and access details about instructors, fees, dates and locations, please visit our Course Catalog! Para Educator Advanced Certificate Classes: These classes allow you to renew and add an area of concentration to your para certificate. Please note that you must hold a Generalist Certificate in order to register for these classes! Substitute Authorization Course: This course is for those who want to substitute teach in grades 6-12 and do not hold an Iowa License. You must have a minimum of a Bachelor’s degree to take this course. Dinosaurs and the Geology of the Rocky Mountains starts January 17 in Choteau, MT. A lot of important learning happens at Moravia Elementary, but for some students making friends can be the most challenging and exciting part of school. Melissa Hanson is a 4th grade student at Moravia Elementary who was diagnosed with Sensory Integration Disorder. When she was younger, she had difficulty making and keeping friends, along with other difficulties that the diagnosis brought. Melissa’s mom, Kirsten, has been an incredible advocate for providing educational information to Moravia staff and seeing that Melissa gets the supports she needs to be successful in school. Mary Echterling, Occupational Therapist, made the connection with School Social Worker Pat Merrick to provide support for Melissa’s social skills. Beginning in 1st grade, Pat worked with Melissa on developing social skills she could share with the class, such as a personalized photo book. By 2nd grade, the social skills group grew to include other peers and the school psychologist, Jennifer Adams. Activities have included a nail-painting party, a tea party, a football party, and most recently a trip to outer space where the students brought back messages of friendship to share with their other classmates. The process of skill building included small groups with female peers and has grown to include anyone in the class who returns a parent permission slip. When asked about Melissa’s growth, Pat Merrick noted that she really wanted to make friends, but had a lot of difficulty doing so. She had many sensory issues that interrupted her ability to connect with others. She would follow peers around the lunchroom, but not be able to engage with them. Now, “She likes having friends AND her friends enjoy her.” Peers seek Melissa out for her play skills on the playground, as well as the cool things she brings to school. Colton Dommer, a junior high student from Moravia, popped his head into the classroom and immediately asked his teacher if he would be riding the bus home. When his teacher responded that he would, Colton asked if he could use the restroom and off he went. This sounds like a very common exchange between a student and his teacher, except that Colton is a student with autism and he does not verbally communicate at all. Colton attends general education classes as well as receives special education instruction and assistance. He also communicates with his teachers, other school staff, and his peers. Colton accomplishes all of these normal school tasks with the help of assistive technology. Colton has used a communication device for a number of years. Teresa Halstead, the Great Prairie AEA Speech- Language Pathologist for Moravia and Kathy Achenbach, the Special Education Consultant as well as assistive technology team member, have worked with Colton since he was in preschool. They had tried a number of communication devices with Colton from PECs (Picture Exchange Communication System) to high-end communication gadgets. The problem with a number of the devices tried was that they were not portable enough to be used to communicate with a number of people. It was also difficult to understand what Colton was trying to say and some were just plain bulky and hard to take from setting to setting. Melissa Thomas, the Special Education Teacher that has worked with Colton since third grade, was frustrated with the lack of versatility of the devices tried. She wanted something that would allow Colton to express wants/needs as well as be portable enough to take to all of the places a student travels in the school setting. It was also crucial that Mrs. Thomas be able to program multiple class tasks and responses that would allow Colton meaningful access to the general education curriculum and be easy and quick to program. A trial with an iPad with an extensive communication application matched much of the criteria as well as producing effective results. Some examples of the general education tasks Mrs. Thomas has been able to program for Colton include developing modified text (matched with visuals) with questions for science and social studies tasks. A unit on Martin Luther King was adapted for use on the iPad with text and questions to match the general education curriculum. 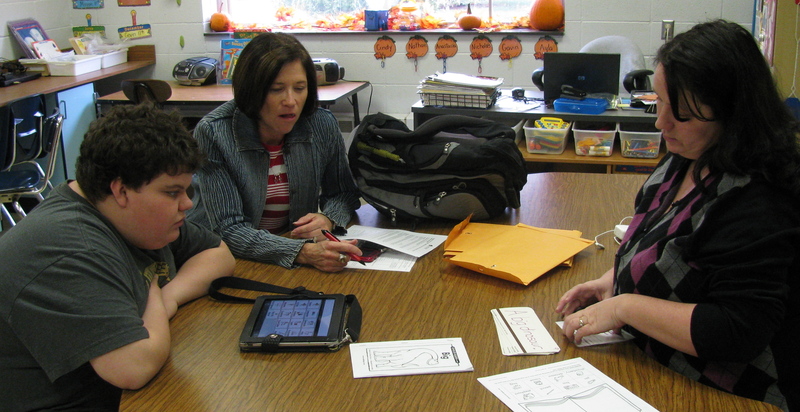 Several math tasks including money, measurement and computation were placed on the iPad program for Colton to use in his math class. Colton has begun job shadowing as part of a pre-vocational program. Much of the communication that Colton would need to use while completing his job has also been placed on the iPad program. He can now ask for various supplies or tools that he needs to complete the job using his portable iPad program. Any of the greetings that he makes to teachers, staff and peers are all included for Colton to access even during unplanned encounters. Colton can even play a game of ‘Go Fish’ with another student with the communication needed pre-programmed. Other iPad apps have been added to Colton’s program to help reinforce skills as well as for entertainment purposes. One app is used to display Colton’s daily schedule. This way, Colton’s schedule is always available for him to check and it is easy to change the events if needed. Colton continues to need instruction and practice to properly communicate during varied social situations as well as general education tasks. Mrs. Halstead remains involved with Colton on a consultative basis to help with these needs. Mrs. Thomas is continually on the look-out for ways she can take a general education or IEP task and utilize the iPad to help Colton better show what he knows. Colton’s mother is pleased with Colton’s ability to better express his wants and needs as well as his increased independence. Most importantly, Colton can also tell her if he is not feeling well. She, along with Colton’s whole team, is dedicated to helping him better communicate in all situations and settings. For more information about the strategies and iPad apps used with Colton, please contact Kathy Achenbach at kathy.achenbach@gpaea.k12.ia.us. Atomic Learning is not one of the new databases for 2011-12, but has huge implications for your school’s professional growth using technology. When we added Atomic Learning a few years ago, the focus was on tutorials – short video clips that showed you how to add columns in an Excel file, insert images into PPTs, and answer other questions on Office, InDesign, PhotoShop, Googledocs, Clicker4, ActivInspire, Kurzweil and many more applications. There are 50,000 step-by-step technology tutorials including topics such as podcasting, Netbooks, iPads, and Facebook to name just a few. But, it can do so much more! Every teacher in GPAEA has an individual Educator account with Atomic Learning. This simple step allows you to plan and implement small groups, grade level groups, building or district level groups to learn as a team about using technology and 21st century skills. Staff members with Admin Rights for your building can set up assessments, schedule assigned or recommended training. Each individual Educator has access to his own ePortfolio. Plus, this year only, Atomic Learning will also help you set up student accounts, for free. Currently, the students can take a 24 or 48-assessment survey, but with individual accounts, they also have more functionality on the site. Your individual Educator account is based on your SNAP UN/PW. Your district may be interested in adding additional admin rights to more teachers. Please see your media/tech staff for more information! Atomic Learning features projects, workshops and lessons. One example from the section on 21st Century Skills, Cyberbullying, No Way, Not Me, is a project on using blogs. The teacher resources include handouts, step by step planning and video links for all technology. Assistive Tech resources are also included in our collection and you can search by standards, both Common Core and the NETS standards. Atomic Learning has two types of assessments. 21st Century Skills Assessment for teachers based on ISTE NETS-T 2008 — a 40-question assessment from a rotating bank provides an indication of 21st century skills knowledge. Pre and post testing, plus a simple ten-point self-assessment can help your staff and students reach goals for their own learning. All of which provide detailed material (in the Atomic Learning way with short video clips) on how we can reach these objectives through four areas – Build your understanding / Put this concept into Practice / Reflect and Apply / and Access to Reference Tools. See this in action through the Spotlight on Effective Online Teaching & Learning at www.atomiclearning.com. LETRS is not a program of any kind and it does not promote the use of specific programs. It does however build participant understanding of the underlying processes that facilitate reading in the brain. State of the art neurological imaging technology and increased attention to the reading achievement of students with disabilities has provided the “perfect storm” for the advancement of research in the field of literacy. The LETRS materials and authors access the most current of this to build a deep understanding of how to most effectively teach all children to read and write proficiently. The latest version of some of the modules of LETRS that the training has focused on is only now being published so that the learning is based always on the latest research available. LETRS continually update the modules to keep current with latest research. As you can see from the list of modules none of the Big Five components of a balanced literacy program have been neglected. In addition to phonemic awareness, alphabetic principle, accuracy and fluency with text, vocabulary, and comprehension, specific attention is paid to the role assessment and writing play in achieving full literacy. Teachers who engage in this learning will develop background knowledge in the linguistic elements of reading and skills in the use of classroom diagnostic assessment. This knowledge and skill will enable them to dig down to the root cause of individual student learning difficulty and develop targeted interventions that accelerate the pace of learning for students who struggle. The course also introduces participants to a wealth of resources that support targeted skills instruction. GPAEA has added a coaching component that LETRS does not include. Regional LETRS trainers support participating teachers, on sight, as they implement new knowledge and skills in their classroom. Great Prairie AEA currently has teachers from eight districts involved in year 1 training and four districts involved in year 2 training. Many Great Prairie staff members are participating in the training with the schools they support. Three schools districts are currently sending teachers to become certified trainers for LETRS. They will then be able to train teachers within their districts (Centerville, Burlington and Fairfield). Great Prairie is sending five additional staff members to become certified trainers for LETRS so that they can provide training to more teachers within Great Prairie AEA. If you are interested in learning more about how to access training in LETRS (Language Essentials for Teachers of Reading and Spelling) feel free to contact Lori Denz (lori.denz@gpaea.org), Jaci Jarmes (jaci.jarmes@gpaea.org) or Shauna Cutler (shauna.cutler@gpaea.org). More and more districts are “going Google” throughout our region. Out of the 34 school districts in our region, 29 have created Google Apps for Education domains, and two others are in the process of setting up their domains. A Google Apps for Education domain is different from regular Google or GMail. A Google Apps for Education domain is an enterprise-level cloud computing system of tools. These domains are free for schools, and they provide more storage and more options for sharing and collaboration than regular Google accounts. Most importantly, the data in the Google Apps for Education is owned and controlled by the school district. The accounts not only provide more options and flexibility, but they allow districts to create and manage their faculty, staff, and student Google accounts. Districts can enable or disable all of the Google Apps tools, including Google Apps Mail, Contacts, Documents, Calendar, Sites, Talk, Video, and Groups. And, districts can control other Google tools, like Blogger, the Chrome Web Store, Google Books, Google Maps, Google News, Google Readers, Google Voice, and YouTube. The Google Apps tools provide teachers the opportunity to engage their students in a 21st-Century learning environment. Students can collaborate with their classmates, their teachers, or experts from around the world on Google Documents or Sites. Teachers can conduct formative assessments with Google Forms, and share their classroom events with Google Calendar. And, innovative uses for the Google Apps are being developed daily. The rollout of Google Apps accounts is varied across the region. In a recent survey of district technology coordinators, most of the respondents said that they have provided Google Apps for Education accounts to their district administrators, teachers, and support staff. About 2/3 of the districts have provided a few, some, or all of their students with Google Apps for Education accounts, and 2/3 of the districts have provided their board members with accounts. Training for users is also varied. When asked how many districts had provided training to their users, some districts had provided training for all of their administrators, teachers and support staff. But most of the districts had not provided all of their administrators, teachers, or support staff with training. Very few districts had provided training to their students. For more information about Google Apps for Education, or to schedule training, contact Seth Denney at seth.denney@gpaea.org, or call 800-382-8970 ext. 1109. Dr. Jack Gerlovich, Distinguished Professor of Science Safety/Education at Drake University, and Great Prairie Area Education Agency have teamed up to provide a workshop that is a must for teachers concerned about safety in their classroom. The workshop will introduce Science teachers to the comprehensive science safety resource “Total Science Safety System” developed by Dr. Jack Gerlovich and Dr. Dennis McElroy.